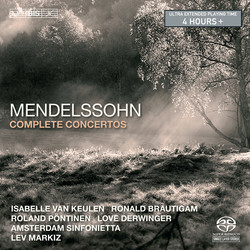 If the String Symphonies, collected on the accompanying release BIS-SACD-1738, are the works by the young Mendelssohn on the way to becoming a fully-fledged composer, the concertos give a more all-round picture of the composer. Beginning in 1822, when he composed the Concerto in D minor for Violin and the Concerto in A minor for Piano, Mendelssohn kept returning to the concertante format throughout his life, until the great E minor Violin Concerto, written three years before his death, in 1844. Between these works can be found the two rarely heard Concertos for Two Pianos – youthful, but surprisingly mature works – as well as his two piano concertos Opp 25 and 40, and three concert pieces for piano and orchestra. Soloist in these is Ronald Brautigam, who will be well-known for his acclaimed surveys of the solo piano music of Haydn, Mozart and Beethoven. Isabelle van Keulen takes on the works involving solo violin, and was at the time of the original release described as ‘a winning soloist with a soft tone like the finest-spun silk – plus strength to match, when required’ (Gramophone). Swedish pianists Roland Pöntinen and Love Derwinger partner each other in the concertos for two pianos, virtuosic works first performed by Felix and his sister Fanny. The accompaniments throughout are provided by Amsterdam Sinfonietta, under Lev Markiz, and were characterized as ‘both polished and warmly supportive’ (Gramophone).